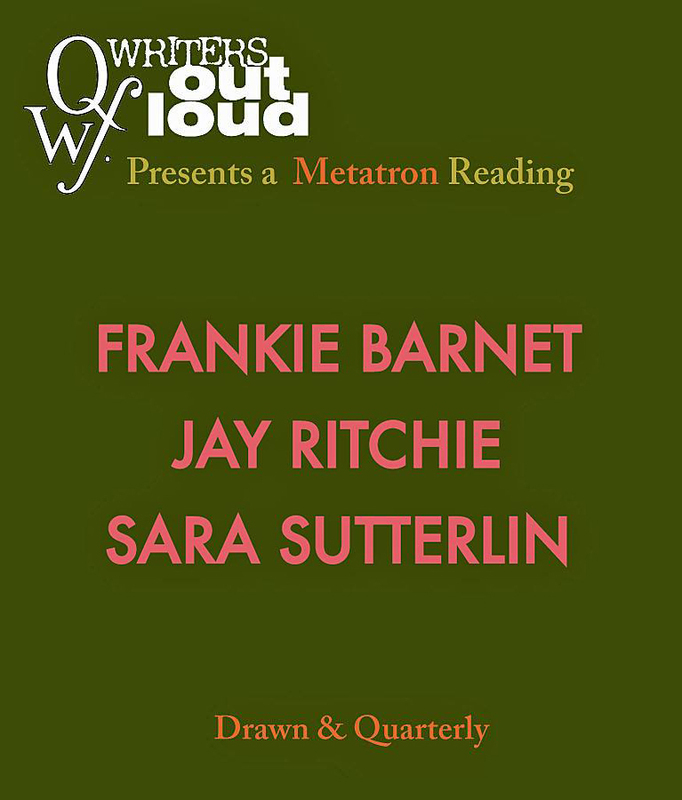 The Quebec Writers' Federation 'Writers Out Loud' reading series, Metatron, and Librairie Drawn and Quarterly are proud to present a showcase of three mega-talented, Metatron authors. The event will be hosted by Metatron's Founder and Managing Editor Ashley Opheim. FRANKIE BARNET is the author of 'An Indoor Kind of Girl' (Metatron, 2016), a bestselling book of fiction at Drawn & Quarterly. She is a graduate of Concordia University's Creative Writing program and a current MFA Candidate at Syracuse University. SARA SUTTERLIN is the author of 'I Wanted to Be the Knife' (Metatron, 2016) and 'Baveuse' (Electric Cereal, 2015). She is the founder and editor in chief of Leste Magazine. She lives in Montreal. JAY RITCHIE is the author of the poetry chapbook 'How to Appear Perfectly Indifferent While Crying on the Inside' (Metatron, 2014), a bestselling book of poetry at Drawn & Quarterly, and the short story collection 'Something You Were, Might Have Been, or Have Come to Represent' (Insomniac, 2014). He is Assistant Editor for Metatron in Montreal. METATRON | Metatron is a Montreal-based publisher specialized in contemporary literature and titles by new and rising authors. WRITERS OUT LOUD | The Quebec Writers' Federation 'Writers Out Loud' series presents readings and conversations with award-winning and emerging English-language Quebec writers of fiction, nonfiction, poetry and children's and young adult literature throughout their home province.